conventional medics and leaving his World Cup hopes tattered. My grouse with this report, apart from its clear ludicrousness, is the impression it will undoubtedly create in the minds of people towards Ghana – as a nation crawling in ‘fetish priests’ with ‘black magic’. unfortunately play up the influence of devilish power rather than the skill, determination and prowess of our boys. 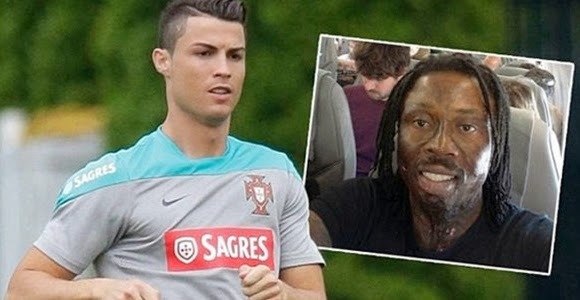 but conclude that Bonsam is nothing more than a rambling popularity seeker who is using Cristiano’s predicament to advertise his counterfeit cures, unashamedly tainting the name of his nation in the process. sacrificed dogs of a scarred herbalist whose mouth is bigger than his means. Here is a hilarious warning message for all Nigerian women from their husbands and boyfriends ahead of the upcoming FIFA World cup 2014 event in Brazil. actors and actresses are wearing soccer jerseys and they are in Brazil.